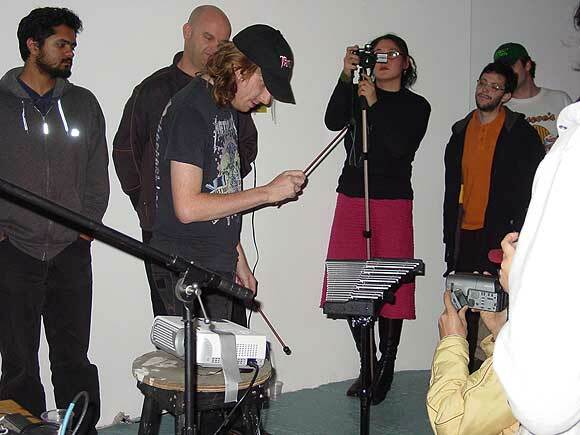 Top: Cory Arcangel plays some glockenspiel parts he added to Bruce Springsteen's Born to Run, at vertexList last night. You may or may not know that that record already, in fact, has glockenspiel on it--it's the tinkly, xylophony sound that Springsteen included on some songs, along with strings, to make the music more "produced," orchestral, and/or Phil Spectorish. I didn't know it, but I have a hard time caring, since I don't like Bruce Springsteen's music at all. I also don't know what Arcangel's relationship is to that music, or the glockenspiel--ironic? admiring? a little of both? In any case, for this performance, he played over the album, karaoke-style, pinging poignantly on the glock in a milieu that might be described as "Dada meets the hits of the '70s meets mallet instrument fan fiction." Whatever I think of Springsteen, I enjoyed the effect this patience-testing performance had on the crowd, which perhaps wasn't expecting something so modest, or arch, from an artist known to do surprise virtuoso pieces. 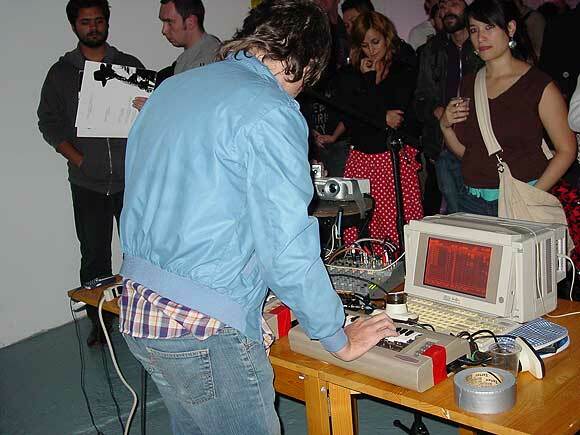 In the bottom photo, Paul Slocum more straightforwardly rocks the audience with his '80s home computer ensemble--note piano keys positioned over a seriously fat QWERTY keyboard. Unlike others in the plinky, fun, 8 BIT school, Slocum makes dark, dense, dreamlike music--a la the Velvet Underground, only with chipdrones instead of guitars and a rhythm box instead of Mo Tucker. Pedal effects to boost the volume and filter sweeps to bend the notes create an engulfing wall of sound. You can hear tunes within tunes inside all the distortion. The occasion was the opening of his solo show at the gallery, and he was playing without his usual Tree Wave partner Lauren Gray. Her vocals were missed but the performance (and his show) were excellent. Also in the exhibit is Slocum's piece Deep House for Symphonic Band and Choir, 2006. It was great to see it in person and confirm this favorable preReview. Updated several times with new info and thoughts.